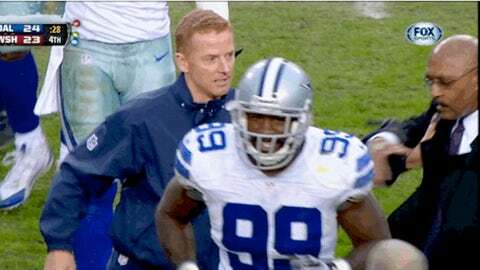 Moments after the Cowboys wrapped up a huge victory over the Redskins on Sunday, Dallas coach Jason Garrett was seen shoving a man in a suit as they ran onto the field to celebrate. Everyone on Twitter instantly asked the same question: "Who is the guy in the suit?" See the moment here, then we’ll explain below. The video of Garrett 'shoving #Redskins security' is actually playful wrasslin w #cowboys Director of Security Larry Wansley. While it didn’t look like Garrett was all that happy, apparently he was just having a little fun.